IIASA is governed by a Council comprised of one permanent representative from each National Member Organization. Regulations concerning the institute’s objectives, conditions of membership, internal structure, and the roles and responsibilities of the Council are outlined in the institutional Charter. The IIASA Charter stipulates that membership of the institute is open to one professional institution from any country as long as it represents the relevant scholarly community of that country, subscribes to the IIASA Charter, and meets the financial obligations of membership. The IIASA Council votes on each country’s application to join IIASA and on whether to discontinue a country’s membership. In November 2017, Council voted to change India’s membership status to observer, with the option to become a full member again as soon as outstanding membership dues are settled. Council also thanked Australia, represented by the Commonwealth Scientific and Industrial Research Organization (CSIRO), for its contribution to IIASA as a member since 2013 and noted, with regret, CSIRO’s decision not to continue its membership in 2018. In December 2017, the IIASA Council agreed to accept Israel as a new member country represented by the Israel Committee for IIASA. Each IIASA member country designates a National Member Organization (NMO) to represent the nation’s scholarly community, and act as a bridge between their research and policy communities and the institute. There are three types of NMOs namely, national academies, government research funding agencies, and autonomous organizations or committees. Each member country fulfills two main roles, which it enacts through its NMO. The first of these involves the governance of the institute through its representative Council Member for IIASA, while the second requires the NMO to act as a link between IIASA and national stakeholders. As the governing body of the institute, the IIASA Council is composed of one permanent representative from each NMO. The Council meets twice a year, in June and November. The Charter and subsequent resolutions of Council document the role of Council, its processes, and decisions. The Council is responsible for establishing relations with government and international bodies; determining financial and managerial policies and subject areas for IIASA research; and ensuring that IIASA activities are in line with institutional objectives, the provisions of the Charter, and the interests of NMOs. The Council elects a chair and vice chairs who act as officers of the Council. After serving for three years, Don Saari (United States) stepped down as Council Chair in 2017. Following a nomination and election process, Council appointed Michael Clegg (United States) as the new chair of the Council on 30 September 2017. Gansen Pillay (South Africa) was elected vice chair commencing on 1 January 2018. Pillay takes over from the previous incumbent, Prabhat Ranjan (India), joining Alexei Gvishiani (Russia) who will continue in his capacity as a vice chair in 2018. The Council appoints the director general and the deputy director general who, as the chief executive officers of the institute, are responsible for implementing the research program and managing the day-to-day operations. In 2012, the Council appointed Professor Dr. Pavel Kabat as the 10th director general of IIASA. Kabat, a Dutch citizen, came to IIASA from Wageningen University in the Netherlands. The IIASA Council exercises its oversight responsibilities through a committee structure comprising an Executive Committee, a Finance Committee, a Membership Committee, a Program Committee, and an Outreach and Capacity Building Committee. At the end of 2017, membership of these committees was agreed for a new three year period. In addition, an external Science Advisory Committee, and external evaluation committees provide specialized input to Council. 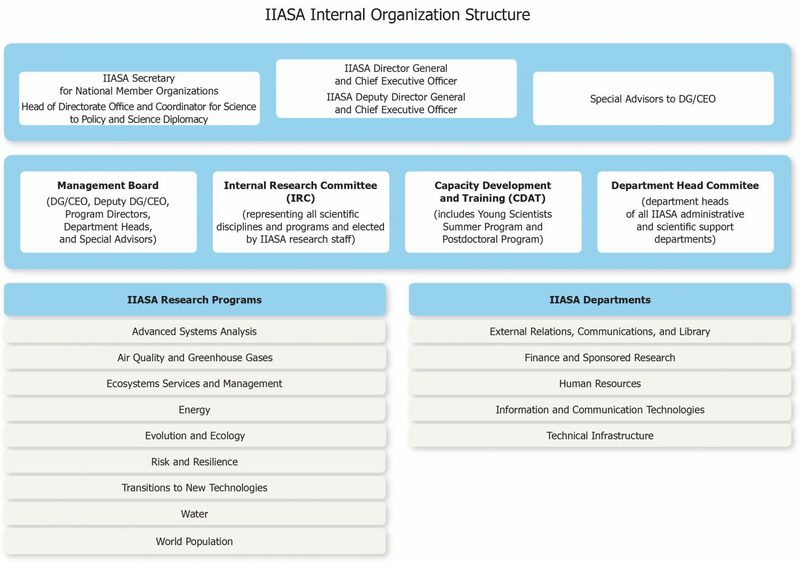 The IIASA Council oversees an array of activities that support its responsibility to offer guidance and assure the quality and relevance of IIASA research. It serves as a critical element in assuring NMOs of the value of the work done by the institute in return for their contributions. In 2016, the Council commissioned an institutional review by an independent panel of experts to provide an independent and comprehensive evaluation of IIASA, including all structures, processes, and activities. The review panel aimed to answer the overarching question of whether the general mission and ambitions, the organizational structure and governance, and the scientific programs and their policy-relevant implications, are fit-for-purpose and future-proof. Following the delivery of the report in June 2017, IIASA Council “welcomed the report of the independent Institutional Review of IIASA and its recommendations to further strengthen IIASA’s unique strengths and global reach.” The report urged the Council and the director general to “work together to establish a Task Force under Council’s leadership to take forward the review recommendations.” At the end of 2017, Council appointed Khotso Mokhele and Melody Mentz (both from South Africa) as chair and secretary of the Task Force respectively. The Task Force will commence work in 2018. Another component of research oversight is the IIASA Science Advisory Committee (SAC). The SAC, established by the IIASA Council in 2002, comprises 15 international experts in fields relevant to IIASA research and its science to policy portfolio. The SAC has an academically and geographically diverse membership—based partly on nominations from NMOs—and includes experts in the main areas of IIASA research. In 2017 its role continued to be to provide independent, expert advice to the IIASA Council and Directorate to ensure that the institute’s work continues to meet the highest scientific and policy-relevance standards. In particular, SAC assessed ongoing crosscutting activities of IIASA. IIASA is currently structured into nine research programs and five departments that support the institute’s scientific activities. In April 2017, the new position of Head of the Directorate Office was established and Jan Marco Müller was appointed to this role. The Directorate Office manages the office of the director general, and oversees Council relations in collaboration with the External Relations, Communications, and Library (ERCL) department. In addition, it provides conference and visitor services for institute-wide events, exercises oversight over the Exploratory and Special Projects program, and coordinates science to policy and science diplomacy activities.